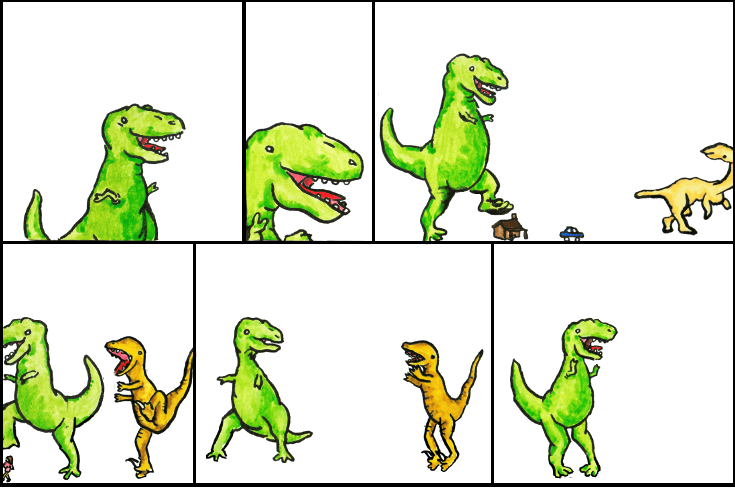 Dinosaur Comics - February 27th, 2008 - awesome fun times! –My body would be found inside a giant RHETORICAL ice cube! February 27th, 2008: So hey, the consensus seems to be that a skateboard on the computer-controlled treadmill doesn't have terminal velocity as it's CLASSICALLY understood, because that's a factor of wind resistance and hey, no wind. Their are factors in how fast the ball bearings in the wheel will allow the board to go, but it's been my experience with longboards that once you reach a certain speed / resistance from the bearings, the heat the bearings generate will actually melt the plastic in the wheels, and then you're stuck walking home. SO, what this invention would let you do is get up to speed quick without any wind resistance, then go faster than you're comfortable going, and then either you'd fall off due to speed wobbles and hit the ground hard - which would hurt as much as hitting the ground at the speed you were going at in real life, since the difference between your speed and the ground would be the same - or your wheels would actually melt off and you'd probably hit the ground anyway.